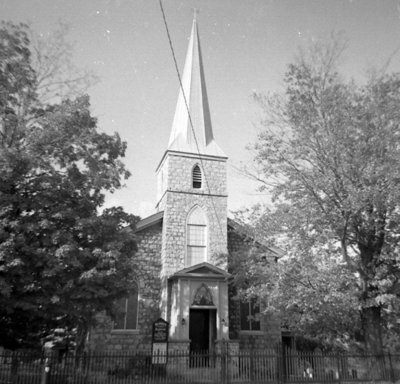 A black and white photograph of St. John's Anglican Church in Port Whitby, Ontario. View is of the front of the church. St. John's Anglican Church was built of Kingston limestone in 1846. It is located at 150 Victoria St. East, Whitby, Ontario (on the north side of Victoria Street, east of Brock Street). St. John's Anglican Church, October 11, 1965, Brian Winter. Whitby Archives A2013_004_185.